All India Institute of Medical Sciences AIIMS is scheduled to conduct Bachelor of Medicine and Bachelor of Surgery MBBS entrance examination on 26th & 27th May 2018. A large number of candidates who are admissions to 7 AIIMS institutions applied for the entrance exam. Candidates who had applied are searching for the AIIMS MBBS Admit Card 2018 as it is the crucial document to carry for the exam and contains details regarding exam venue, roll number etc. AIIMS will release MBBS Admit Card 2018 today (Expected). Candidates can download hall ticket from the direct link provided below. The All India Institutes of Medical Sciences (AIIMS) are a group of autonomous public medical colleges of higher education. These institutes have been declared by Act of Parliament as institutions of national importance. AIIMS New Delhi, the fore-runner parent excellence institution, was established in 1956. This year it has released notification for AIIMS MBBS and the candidates who had appeared for the exam can download AIIMS MBBS Admit card from the official website. AIIMS released notification and invited online applications for the MBBS Entrance exam. The medicine entrance examination is conducted for the admission to 672 seats in 7 AIIMS institutions located at different states of India. A huge number of eligible and interested candidates applied for the exam. Candidates can download the admit card from the direct link provided below. The admit card will available online only. The AIIMS MBBS entrance examination is the computer based test which consists of 200 multiple choice questions from Physics, Chemistry, biology and General Knowledge. Of which 60 questions from each Physics, Chemistry and Biology and 20 questions from General Knowledge. AIIMS MBBS 2017 is an online (computer based) test and will be held in two shifts. First session will be held in the morning, timing being 09 am to 12:30 pm. Second slot timings are 3 pm to 6:30 pm. Time duration is 3 hours and 30 minutes for both shifts. 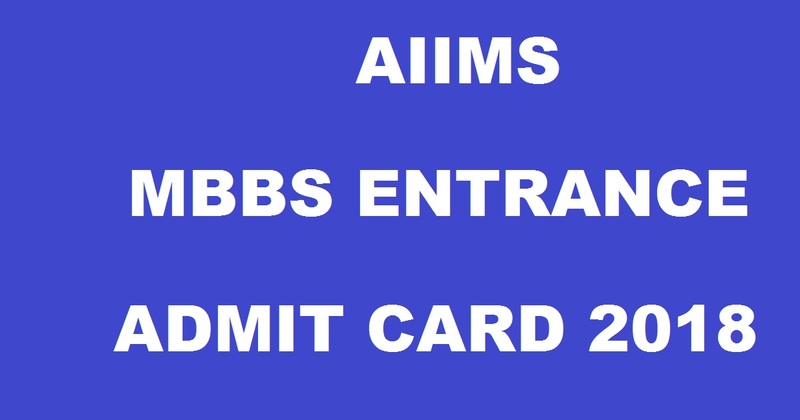 How to Download AIIMS MBBS Admit Card 2018? 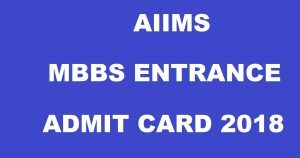 Click on AIIMS MBBS 2018 Admit Card. Download/ Take a printout and carry to the examination. Stay tuned to this website. We will update AIIMS MBBS answer key, results here. Press CTRL+D to bookmark this page for easy navigation.